Pronounced "po-va-teets-sa." Handcrafted with a traditional recipe and the finest ingredients, this old-world gourmet treat has been a long-time favorite around the holidays. To make each one-pound loaf, sweet bread dough is rolled thin, spread with filling, hand-rolled, and finally baked to a golden perfection. English Walnut povitica boasts layers of crushed walnuts, honey, and real butter, with swirls of flavor in every bite. 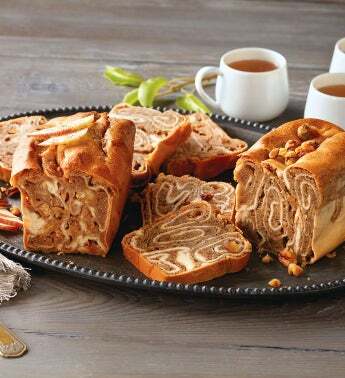 Made with creamy butter and cinnamon, the Apple Cinnamon povitica loaf is made with abundant tender chunks of sweet apple. Slice and serve gently warmed or toasted. Kosher.